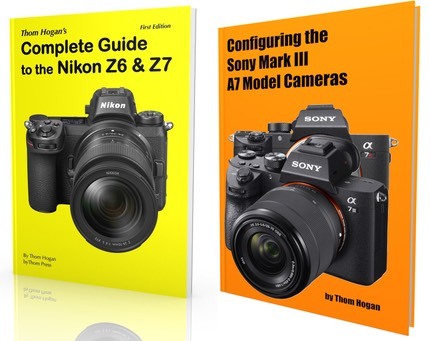 TechRadar reports a quote from the UK Marketing Manager for Nikon saying: "...ultimately, we want pros to be buying our DSLRs...I'm not sure [a pro Nikon 1] would help us to be the number one brand." Sorry, but very wrong thinking. Indeed, completely bungled thinking. The correct thinking would be "we want every pro to have a Nikon 1 in their bag along with our DSLRs." The Nikon Marketing Manager's quote is a bit like saying "we won't make minivans because we want our contractors to buy trucks." No, you want your purchasers to buy any and everything Nikon. If you think a pro only carries one DSLR, you're badly mistaken. Moreover, you absolutely, positively, tremendously want that pro to be shooting with your Nikon 1 for casual shooting. You want them to tell all the people that ask "yeah, it's a great little camera for casual shooting." Myopia can become not only viral within an organization, it can prove fatal, too. So let's help Nikon along here by doing a little survey.